The actual baseball part of Wednesday’s game went quite well for the Tigers as Max Scherzer (13-0, 116.2 IP, 3.09 ERA, 2.63 FIP, 3.7 WAR) made another fine start, going 6.1 innings, allowing just 2 runs, while walking 1 and striking out 8. He was supported (no way?!) by 6 runs, 3 coming on an Avila homer, 2 from Martinez on a single and a homer, and one from Peralta AND a ridiculous catch by Austin Jackson in centerfield. Things got quite heated, however, when Colby Rasmus injured Omar Infante on a dirty slide and then Jays pitcher Todd Redmond came up and in on Torii Hunter in the very next inning. The benches cleared, but Prince Fielder and company helped keep the peace. Scherzer gave way to Rondon, Smyly, and Benoit who held the lead and guaranteed the Tigers no worse than a split during their only trip north of the border. They’ll call on Justin Verlander (8-5, 105 IP, 3.77 ERA, 3.05 FIP, 2.8 WAR) to go for the outright series win on Thursday, and hopefully Jim Leyland won’t get him suspended like he did with Porcello. 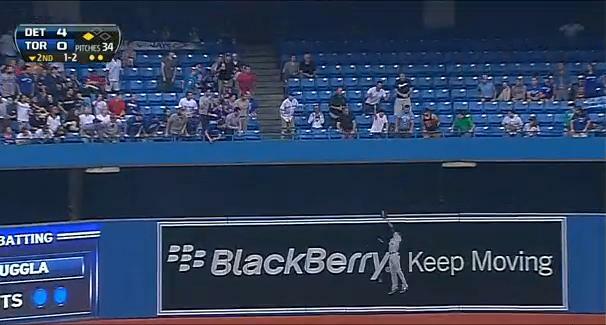 The Moment: Jackson makes a leaping catch to rob the Jays of extra bases.